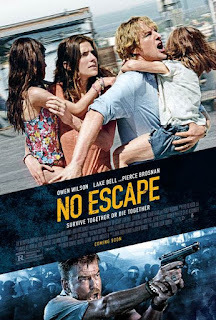 Enjoying the film NO ESCAPE depends on what you go to the movies for. The beauty of film is that each one offers a unique experience for each audience member. Like any form of art, it speaks to you or it doesn’t. NO ESCAPE is a unique experience, it just depends if it’s the one you want to have. When the film opens, we are in the midst of a coup in an unnamed Southeastern Asian country (we know we’re near Vietnam, so it’s probable we’re in either Laos or Cambodia). A rebel group has risen up and removed the government in power. As the coup unfolds, a family of four from Austin, Texas is mid-flight, permanently relocating to our country in turmoil. Our patriarch is Jack Dwyer, played by Owen Wilson, who is bringing along his reluctant wife Annie, played by Lake Bell (WET HOT AMERICAN SUMMER: FIRST DAY OF SUMMER, IN A WORLD…), and his two young daughters. Jack is relocating due to work. He works for a clean water organization that is taking over the water facilities in this particular country. Jack and Annie’s marriage seems to have taken a hit due to the relocation. On the flight, the Dwyer family meets an Australian tourist named Hammond (Pierce Brosnan). Hammond is rough around the edges, but his offbeat and dry wit make him a blast to watch. He’s also hugely useful because he is a frequent visitor to the country and can show the Dwyer family around. As Hammond and the Dwyer family get settled in their host country, things turn sour in a hurry. Jack’s stroll to pick up a newspaper puts him in the middle of a violent riot in the streets. We quickly learn that part of the coup is due to the new water company’s presence in the country. Anti-Western sentiment is clear as the rebels go after anyone who appears to be of American or European origin. In what becomes a warlike environment, Jack and Annie do everything in their power to protect their daughters. The rebels are massacring buildings full of people, and the audience is spared nothing when it comes to watching the violence unfold. Brosnan gives an energetic performance that is ultimately under utilized and played for pragmatic purposes only. All of the performances are worthy of praise. Owen Wilson and Lake Bell, both veterans of comedy, give grounded and realistic performances, a strength of the film. The movie tries to work in the geopolitical subplot of Western companies taking advantage of small third world nations who simply cannot afford to pay the debt they owe first world countries. As a consequence, the first world countries can pretty much do as they please in these areas. A reality in some areas of the world, but the movie treats this plot with such afterthought, that it is barely visible as a moral compass for us to hold onto. NO ESCAPE has more in common with TAKEN, a film about a man who is trying to take care of his family, than a true geopolitical thriller such as SYRIANA. What’s worse is the movie seems to make the point clear that these first world businesses should be ashamed of how they take advantage of poor nations while at the same time making those rebels fighting back against it as despicable as possible. So who do we root for in NO ESCAPE? Jack Dwyer, the company man (unaware of the reality of the situation), or the rebels who feel abused, but slaughter everyone in sight? Writer and director John Erick Dowdle (QUARANTINE, AS ABOVE, SO BELOW) leaves us no choice but to cheer for our American family. They’re innocent and have two little girls who don’t deserve to witness mass murder. Plus, the Asian rebels, while politically inspired, come across as mindless henchmen killing everything in sight. Like the country in which the film takes place, the rebels are faceless and nameless.